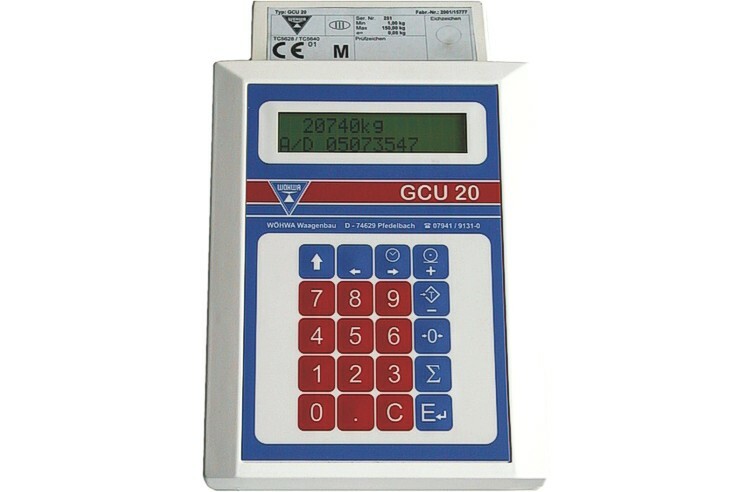 Weighing terminal GCU 20 for general static and dynamic industrial weighing applications, e.g. truck scales. Up to 8 load cells can be connected to the GCU 20 (resolution up to 6000 d, legal-for-trade, class III). A PC can be connected via a serial interface RS232 and a printer via a CENTRONICS interface. With an additional RS422/RS485 interface, a remote display can be connected. Simple and safe operation via robust plastic-foil keypad and backlit, 2-line alpha-numerical display. 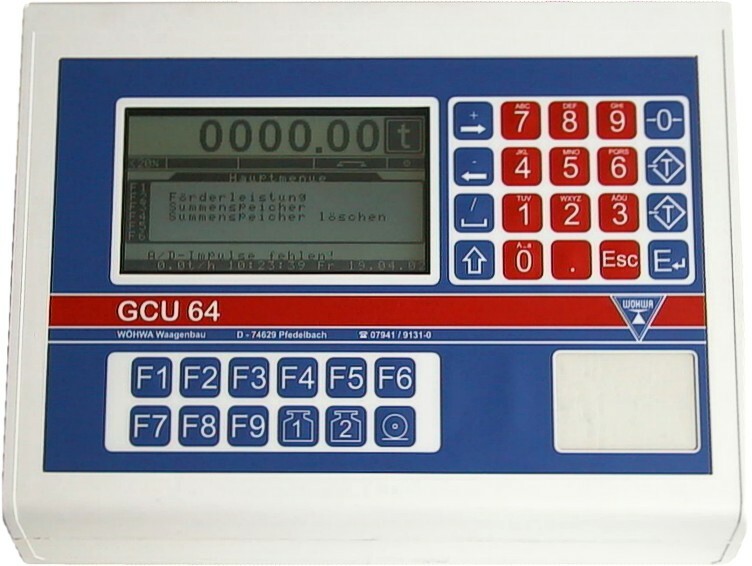 The weighing terminal GCU 50 has been designed as a field unit for outdoor applications. It is suited for in-situ installation at the belt scale, for wall-mounting, or for integration into a control panel. Optionally, several interfaces can be provided for connecting the terminal to a host process visualisation and control system. The terminal has a backlit display, and the belt scale is operated via a robust, dust-tight and water-tight plastic-foil keypad. Power supply optionally 100 - 240 V, 45 - 65 Hz, 36 W or 24 VDC, 1.5 A, battery-backed. Analog output 0 - 10 V or 4 - 20 mA for transmission of ﬂow rate. Pulse output for transmission of belt rate, weight per pulse adjustable. Protocols for polling ﬂow rate, belt speed, quantity, totalizers, etc. 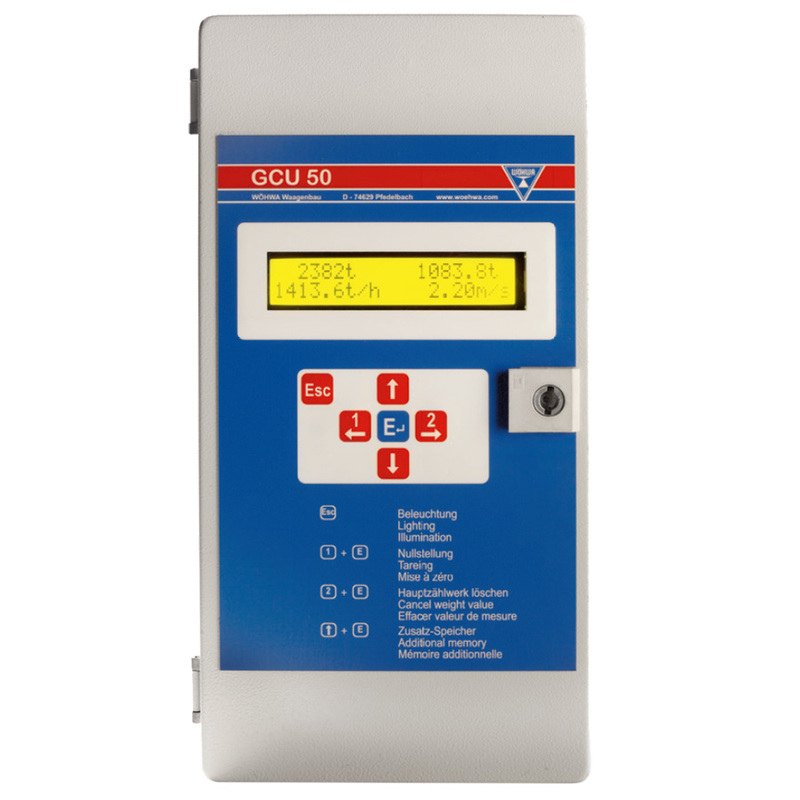 The new weighing terminal GCU 64 (with 64-bit micro-processor) has been designed for static and dynamic weighing applications and is also available in a legal-for-trade version. Beyond standard functions, the terminal can be used for complex control and regulation tasks. For this purpose, it needs to be equipped with additional interfaces and digital or analog inputs and outputs. The programmes are modified by WÖHWA software engineers to adapt to individual customers’ requests. For safe and simple operation, the terminal is equipped with a clearly laid out and robust plastic-foil keypad and a full graphics LCD display. Integration into processing systems via PROFIBUS interface. The terminal offers a multitude of expansion possibilities allowing you to remain flexible for all your applications. The WÖHWA weighing terminal may be upgraded at any time for the control of peripheral devices such as remote displays, barriers, traffic lights, frequency converters, etc. The terminal can be equipped with a maximum of 7 serial interfaces RS232 or RS422/485 (optionally 2 of which may be TTY current loop interfaces), 2 CENTRONICS printer interfaces, 32 digital inputs or outputs 0-10 V or 0-20 mA / 4-20 mA. Additionally, a PROFIBUS interface can be integrated. A PC keyboard may be attached for easier and faster data input.